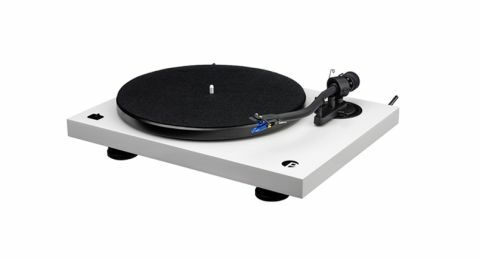 Pro-Ject Debut III S Audiophile review | What Hi-Fi? Pro-Ject’s Debut range of affordable turntables is fast approaching its 20th birthday. Launched in 1999, the original Debut deck filled a gap at the affordable end of the market at a time when many thought vinyl dead and buried. Instead, the Austrian company has found itself ideally positioned to capitalise on the vinyl revival of recent years. The Debut III S Audiophile confirms the range’s new position in (just about) mid-market territory – Pro-Ject now offers even more competitively priced decks aimed at both new and reinvigorated vinyl enthusiasts. That means we can expect a decent level of performance - which will be necessary if the Debut III S Audiophile is to compete with fine record players such as the Rega Planar 2 (£375) and Audio Technica AT-LP5 (£330). There are a few upgrades on the Debut format here, which aim to give credence to the ‘audiophile’ moniker. The S refers to the S-shaped tonearm, the first time such a design has appeared on a Debut turntable. This design is often claimed to improve tracking and reduce distortion compared to a straight equivalent, though it’s often more a simple matter of personal preference. Available in black or white, the design of the deck is certainly smart. The plinth feels solid and well put together, and the overall impression is of an upmarket alternative to its competitors. Some of that solidity is down to the user, however. As with any turntable, there is a degree of set-up required here. The Debut III S Audiophile comes with two (upgraded) aluminium feet in place at the front but we screw in a third at the rear. The steel platter and felt mat must be put in place, along with the belt drive (you’ll need to move the belt to switch between 33 and 45rpm steps on the motor pulley). Take care to follow the tonearm weighting instructions, too. There’s a new, specially designed Ortofon cartridge, which comes pre-fitted. It’s called the Pick-IT 25 A and is a variation on the OM Series. Eagle-eyed readers will also notice the new Pro-Ject Audio logo. Elsewhere there’s a detachable stereo phono cable and a lid to keep dust off the deck, which - as well as the belt-drive motor and power supply - is the same as found on the Debut Carbon (£350). You will need a phono stage to get up and running, whether that’s a dedicated off-board unit or an integrated part of your amplifier. There is no need for Pro-Ject to radically rethink its sound - past Debuts have been good or excellent - and we’re happy to report much here is pleasantly familiar. Listen to Four Tet’s Circling and the repetitive rhythms are handled confidently. There’s a good level of detail and decent dynamics, and the Pro-Ject handles the full sonic spectrum without wavering. Treble notes are crisp and bass drums are solid. Previous Pro-Ject decks might have given a little away when it comes to bottom-end depth and solidity, but there’s no sign of that here. Aphex Twin’s Selected Ambient Works 85-92 demands a firm grip of lower frequencies and this turntable proves highly capable. Timing is mostly spot-on, with only the most challenging tracks lacking a little momentum and drive compared to class-leaders. We turn to Nick Cave’s People Ain’t No Good to see how the Debut III S Audiophile handles vocals. It’s an excellent recording and the deck successfully relays the expression in Cave’s voice and the atmosphere of the recording session. You can almost tell how close Cave is to the mic as you get a feel for the size of the recording studio. The more expensive Planar 2 might dig up more detail, but you won’t feel remotely short-changed by what this Debut can do. Product ranges don’t hang around for the best part of 20 years without reason. The S III Audiophile is solidly designed and smartly finished - and though there may be a new logo and tonearm design, it’s a chip off the old block. All in all, this is another excellent Pro-Ject Debut turntable and one you need to hear.